I was late to the beet game. My mom never served them when I was young, and once I started cooking, I tended to avoid their seemingly messy prep work. Clearly missing out, I’ve been trying to make up for it ever since. 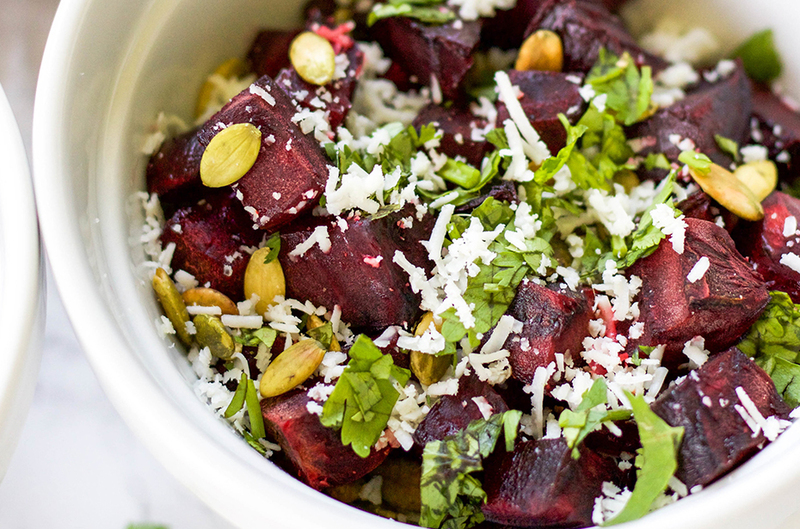 When prepared right, beets are deliciously sweet. Rich in fiber, folate, potassium, iron and vitamin C, beets are also associated with improving blood pressure and improved blood flow. There have been studies to show beet juice may increase exercise performance, and Sean swears by beet juice. My favorite prep method for beets is to cube first then roast. 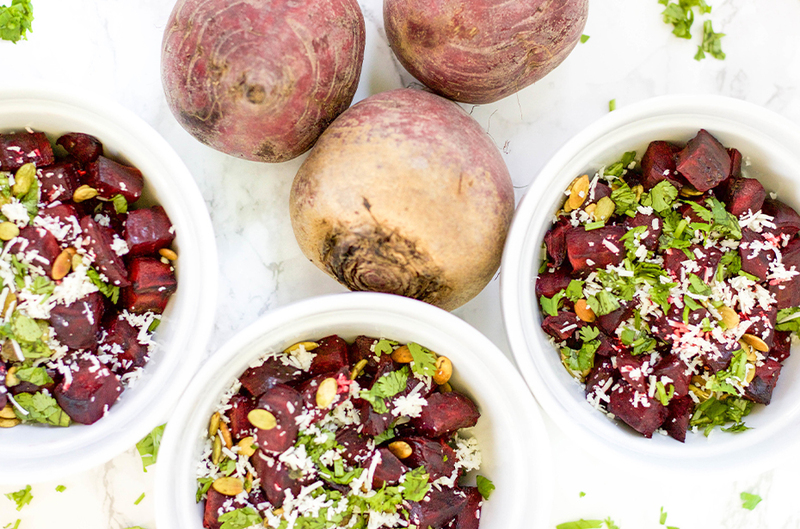 You can roast them whole in foil then chop, but I’ve found peeling and chopping beets before roasting is not only easier on the hands but brings out the best flavor. They’re great when roasted with just a bit of olive oil and salt and pepper, but I wanted to up the ante a bit and kept going once they were out of the oven. Instead of the expected vinegar, I used pickled jalapeño juice, then tossed with some cilantro, toasted pepitas for a little crunch and just a sprinkle of cotija cheese. 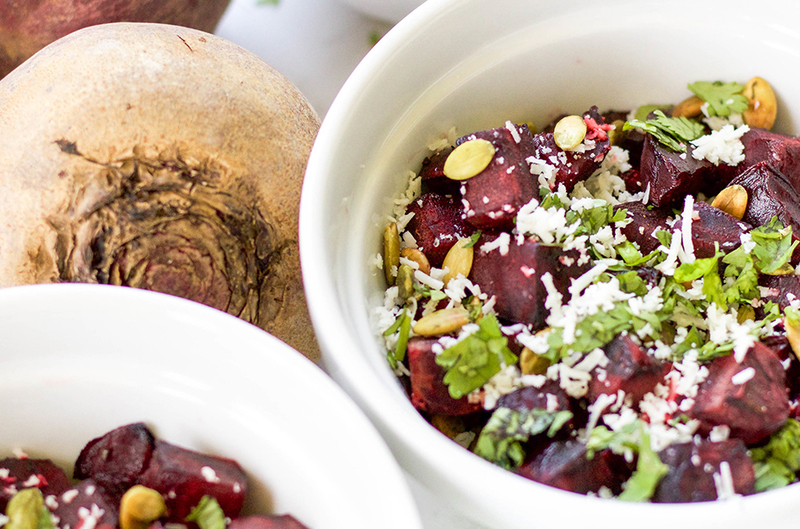 The result is a sweet and spicy salad that is not only differently delicious but also so beautiful and perfect for the your next holiday party. In a large rimmed baking sheet, toss the cubed beets with the olive oil and salt and pepper and cook for 25-30 minutes until soft tender. Remove from the oven and toss with the jalapeño juice, cilantro, cotija cheese and pepitas. Creamy carrot ginger soup for a beautiful and colorful dinner packed with flavor and nutrients. A Reisling is beautiful with spicy foods like this. If you prefer red, go with a bold Syrah. Make clean-up easy, and use parchment paper on a sheet pan when roasting.